I heart baths. Love, love, love them. But I hate paying a ton for luxurious soaks. 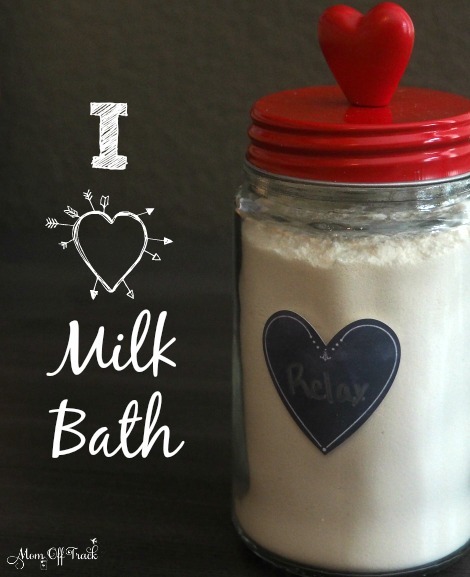 This DIY Milk Bath recipe is both economical and luxurious so grab your robe, put on some relaxing music and get ready to soak away your troubles–all while using things you likely have in your pantry! Essential oil. You could do any of the following combinations but certainly not all in one jar! Mix all ingredients into a large bowl and mix well. Add to a mason jar and cap tightly. The one pictured was purchased at Targets Dollar Spot. Wait 24 hours before use. The recipe can be used for 4 baths using a little less than 1/2 cup each time and can be stored for roughly 3 months. *This post is part of an amazing round-up of Valentines Day Crafts. Click the button below to see all of the featured crafts and check back as new ones are being added all week long! Do you have any Valentine’s essential oil combos not listed? Share them in the comments!